The unit has received 260 case referrals since its launch in June 2018. Of these referrals, 83 were taken on by the unit for further risk management – which has included direct contact with the victim and/or offender. Partners have worked together on the other 177 cases to ensure they are effectively investigated and managed. 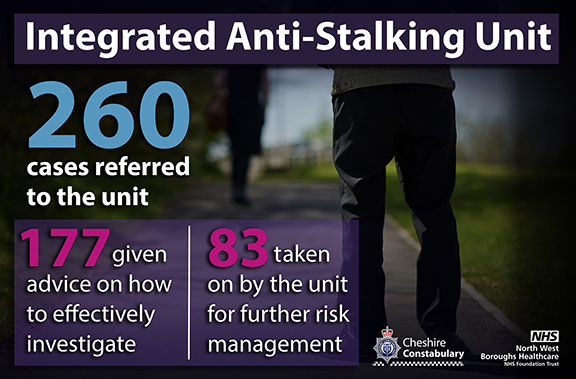 This week, (8-12 April), is National Stalking Awareness Week, and to support the campaign, Cheshire Constabulary and North West Boroughs Healthcare are sharing the story of a woman stalked by her friend, and left petrified – until the IASU stepped in. The Local Policing Unit (LPU) referred the case to the IASU following a thorough review of the case and vulnerable person risk assessment – due to the nature of the complaint made to police. The Unit provided an enhanced level of support for Sarah, ensuring her safety – as well as tackling Andy’s stalking behaviour to establish the root cause of his offending. Sarah also had access to the unit’s Independent Stalking Advocacy who supported her through the criminal proceedings – enabling her to articulate the psychological and emotional impact Andy’s action’s had on her in her statement, and ensure a robust restraining order was put in place. Significantly, Andy reports he has no intention to seek out, contact, or communicate with Sarah – despite continuing to live in close proximity to her. The IASU is able to monitor and coordinate the wider policing response to enforce the restraining order and ensure any conditions are adhered to. National Stalking Awareness week is about raising awareness of stalking and the stories behind the statistics. This year Suzy Lamplugh Trust and the National Stalking Consortium are focusing on the impact stalking has on victims’ mental and emotional health as well as their physical safety.